Tilapia is economical and has a mild flavor that adults and kids alike enjoy. 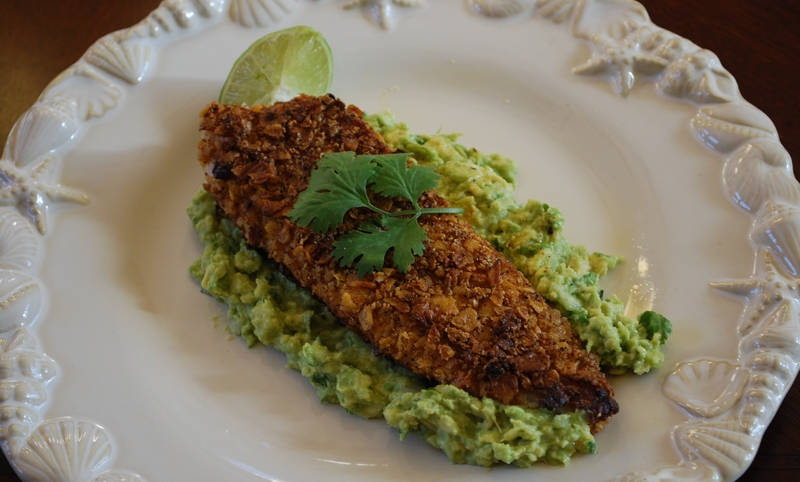 This type of mild flavored fish lends itself well to being creative in its preparation. I chose a slightly spicy take that paired perfectly on top of the avocado mash. However, you can increase the amount of spice to your liking. I purchased two pieces, but as you can see, you can make it into 4 pieces easily because each of the filets has two sections to it. So I cut the filet in half vertically and our family of four was satisfied. Because avocados are filling a side dish really isn’t need. Crush tortilla chips in a ziplock bag with your hands until they have a very fine consistency and combine with chili powder and ground cumin. My boys love helping in the crushing process so you may want to engage your kids in this process! Place the tortilla mixture on a medium plate and set aside. I prepped the mixture first so when I cook the fish it will go quickly to avoid the avocado mash from browning. Make the avocado mash by cutting the avocado and placing all mash ingredients in a medium bowl and mash with a fork or potato masher to a chunky consistency or finer consistency if desired and set aside. Add egg beaters or egg mixture to a medium shallow bowl. Cut filets in half vertically, rinse and dredge filets in eggs and then pat both sides of tilapia filets with tortilla mixture, until evenly coated. Preheat olive oil over medium high heat and add filets. Cook on both sides for about three minutes or until a nice golden brown. Remove from skillet, place on top of the avocado mash and serve immediately. Try Pomelo Sauvignon Blanc (California), Root:1™ The Original Ungrafted Sauvignon Blanc (Casablanca Valley), Paulo Alto Reserve (Chile), a Corona with a wedge of lime or try my Classic Margarita.